While our road freight network extends throughout the UK and Europe, Ireland is our key destination. We have a daily service to both Belfast and Dublin and it is here that our depot is ideally situated to complete the distribution chain. All our drivers are carefully chosen and fully trained to provide the professional, dedicated service that is vital for success in the highly competitive road freight market. Whatever the consignment, however time-sensitive or precious it is, you can be confident that it will receive the care it needs and benefit from all our knowledge and experience of road freight distribution. Extending through Europe, we have strategically placed agents to ensure your vital cargo reaches its destination in a timely and economical way. We also offer overseas shipping to Malta and Cyprus via Southampton Docks. 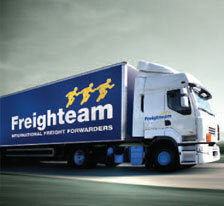 Copyright © 2010 Freighteam. All rights reserved.